When the flat roof over an inmate housing unit at the Kentucky State Reformatory needed to be replaced, the maintenance engineers called in Exterior Pro Roofing for the flat roof repair options that would fit into their operating budget. The existing roof all ready had two layers of torch down style asphalt roofing in place and leaks over the years had caused significant damage to large areas of the wood decking.The flat roof was not a good candidate for a lay over type application, it needed to be torn off and the decking repaired. A tear off would add labor cost and also dumpster cost to the flat roofing projectso in order to help control expenses, Exterior Pro Roofing recommended that the new flat roofing membrane be installed mechanically attached ( screwed down ) rather than fully adhered ( glued down ). Learn more about mechanically attached here. The Duro-Last Commercial Roofing System would fit this building well and keep the project cost under control. 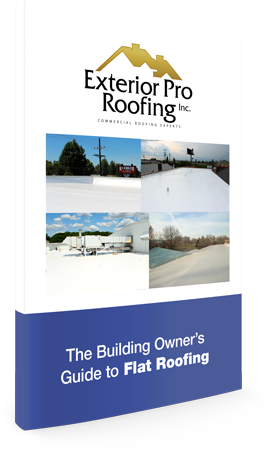 The reformatory agreed with Exterior Pro Roofing's suggestions and chose the 20 year, white, PVC membrane from Duro-Last to cover the housing unit. It took less than 3 days for the skilled flat roofing crew to remove the old asphalt roof, install new, ridged roofing insulation, and the new membrane. In addition to the new roof, the bad wood decking was replaced, the fascia board was replaced and cover in new metal, and new 6" gutter was installed on the back of the building. The picture here are stock photos, due to no photographs were allowed on prison property.